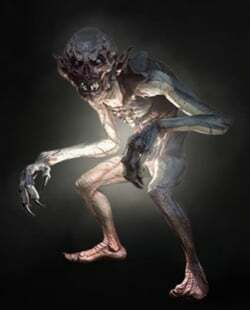 Foglet is an Creature/Monster in The Witcher 3: Wild Hunt. "If night ever catches you in the swamps, stay put and wait for dawn, even if it means standing waist-deep in water with leeches crawling down your trousers. Most important of all, if you see a light in the fog, never, and I mean never, go towards it." Fog is the traveler's foe. In the forest, it can make one lose one's way, at sea, it can send one sailing into the rocks. Yet such dangers are nothing compared to the monsters known as foglets which sometimes lurk within it. These creatures have powerful arms and claws like zerrikanian kinjals, yet what makes them truly dangerous is their mastery of deception, beguilement and disorientation. Many times they need not attack at all, instead simply driving their prey to madness or into boggy marshlands, after which they wait patiently for it to drown in the muddy waters. Don't let their low levels and crouching stature fool you. Foglets are powerful melee combatants that will often sneak up on you while invisible. Their fog clones can stagger you but they deal no damage. Quen is helpful for safeguarding against their stealth attacks. In the contract, "Swamp Thing" Geralt faces an ancient Foglet named Ignis Fatuus. They are extremely vulnerable against Axii. Also using Axii whenthey are ethereal (light) will cause them to reveal themselves. Tested on Ignis Fatuus in Contract: Swamp Thing on Death March difficulty.